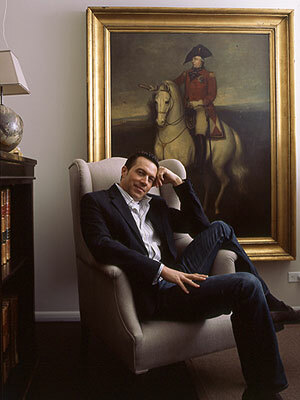 Lee Stanton is one of Los Angeles' leading arbiters of style and the premier purveyor of fine period antiques to prominent interior decorators and discriminating clients nationwide. For years, his San Juan Capistrano warehouse was a go-to for those in the know on the look out for 17th-19th century antiques. Early morning lines would form hours before doors opened, as news of fresh crates from Europe, spread through out the city. Knowing that so many of his clients traveled from the Los Angeles area, Stanton, decided to open doors along the prominent, La Cienega design corridor. Stanton's lovely and down to earth demeanor coupled with his generosity to share his vast knowledge, will have you immediately understand why he is held in such high regard. I am bookmarking as I am anxious to hear the interview! Something wrong w/ the sound on my new computer, but I will definitely be back. I am excited about this interview. So strange, I just left a message on Joni's email asking when this would be "aired" and low and behold, here it is, but I cannot get it to download, is there a problem? Looking forward to hearing a fresh interview. So sorry, I got it to work, so no problems! Thanks, listening as we speak. Thanks so much to Mr. Stanton and the Great Skirted Ones. Two of the things I enjoy most: First the little insights into the business. I'm dead after a few hours slow waling the Scott Market, I can't imagine 3 days of jet lagged dawn to dusk shopping in a foreign language. Second, I enjoy listening to a fan of his own business. Here's a third for good measure: It's very encouraging to learn about "Legends of La Cienega." Not many places have the critical mass to do all this but most places can do something. Could Joni have interrupted or cackled more in an interview? Joni claims to be an expert on spotting fakes although untrained. This is beginning to take on the traits of a comedy show - not a serious interview. Joni, take a second look at some of those painted pieces in the Houston House No. 1 - please! one year! How did that happen? loved Scott last week and can't wait to listen to Lee with you three this week....keep up the great work ladies! I love The Skirted Round Table and I especially loved this interview with Lee Stanton. Informative, fun and inspiring! Of course you all KNOW this is my most favorite interview ever. Lee is extremely generous with what he shares, and quite amusing, too! What a fun, fun podcast, one I will listen to a few times. The "hand on the piece" rule does apply around here, as well. Makes for very funny positions while trying to view a piece from a far, when one shops alone. :) xoxo as always, fabulous work. Great Interview! This was my first time listening to your Interviews and I think you ladies made it very easy to listen too! Great Job Lee, Cant wait to see what this years LCDQ event will have in store! Wow! What a down to earth gentleman! I have heard so many wonderful things about Lee Stanton but have never had the opportunity to meet him. I was thinking about traveling to LA for the Legends of La Cienega event. Now it is a must! Another excellent interview! Thank you so much . . . I can only imagine the time that goes into each one, so thank you for making it possible for us to "listen in" on these insightful conversations. I've heard every single one now - a few of them twice, actually - and have enjoyed each episode thoroughly! I wanted to thank all three of you for a year of fantastic interviews. I've enjoyed them all. I am downloading Lee Stanton's interview on my iphone as we speak. I can't wait to listen to it on my walk tomorrow morning! His store is one of our favorites. Catching up on some interviews I bookmarked - this was terrific. Not helping my longing to move to LA, however. Susanna Salk's Room for Children PLUS a giveaway!